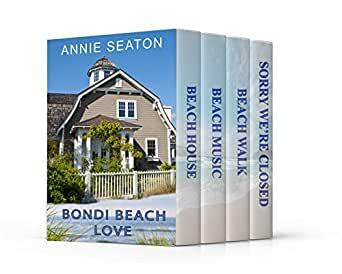 The four popular Bondi Beach Love books in one boxed set. Sally Smith is content with her life despite her twin sister, Sonia, telling her she doesn't have one. One dose of heartbreak was enough to do her for a lifetime, so she plays it safe. Until her twin meddles and then takes off to Hawaii leaving Sally to deal with the fallout. The tarot cards told Sonia it would bring Sally her happy-ever-after, and the cards don't lie. Beach Walk: Sonia Smith lives in the haunted house on the hill above Bondi Beach. Well, maybe it’s not haunted, but the hint of a ghost in the old house where she reads tea leaves and tarot cards is good for business. When fashion designer, Dave Harris, turns up on Christmas Day, the last thing Sonia needs is a slick businessman telling her what to do. Loved this boxed set of stories set at the iconic Bondi Beach ... you can nearly smell the salt air and hear the waves crashing on the rocks. Really enjoyable stories of the three women living on the house on the hill. Rosie is devastated when aunt Aggie dies. Aunt Aggie was her foster mother and they were very close. Rosie still lives in the house she grew up in, a beautiful beach house at Bondi Beach. She's carefully looking after it together with her two best friends and she runs her business from home. However, Aggie has a nephew, famous surfer Taj, and is dividing the inheritance between them. Rosie's always been a huge fan of Taj, but does she still like him as much now that he will be a regular part of her life? Beach House is a wonderful romantic story. Rosie is a talented woman. She runs a successful business, she managed to look after Aunt Aggie by herself and she always has the time to support her friends. She's a sweet girl with a big heart. She's also a big fan of surfing and loves Taj's achievements. Taj doesn't know much about Rosie and his first impression isn't positive. Rosie realizes that the man of her dreams can make her life incredibly difficult and it was interesting to watch her solve her problems. There's plenty of chemistry between Rosie and Taj and finding out if they'd be able to overcome their differences kept me glued to the pages. Annie Seaton has a lovely easy flowing writing style that always makes me happy. Beach House is a fascinating love story with plenty of unexpected twists and turns. I love a good true love story and it put a big smile on my face. I liked how effortlessly Annie Seaton describes the relationship between her main characters. She combines this with a gorgeous intriguing setting that's a true joy to read about. Beach House is a fabulous lighthearted read, a great love story that I read in one sitting. Sally likes safety and security. She's living in a big house at Bondi Beach, which is also the place she runs her business from. These days it's mostly just Sally and her twin sister Sonia. When Sonia travels to Hawaii she leaves a parting gift for her sister, an advertisement in a local paper that will send clients to Sally's door she'd rather not receive. However, one of those clients isn't interested in the actual execution. Sol arrives at the house to ask Sally for scientific information. After a rocky start Sally is more than happy to give it to him. Will the arrival of his studious man change Sally's future forever? Beach Music is a fabulous story about true love. I was immediately intrigued by Sol. He's a wonderful intelligent man. He loves animals, he cares about people and he's thinking about his calling in life and what he can contribute. Sol and Sally are both serious people, but together they have a lot of fun. I loved how they understand one another and I enjoyed watching their sparkling friendship and amazing chemistry. They are a perfect romantic couple and I enjoyed every single page of their story. Annie Seaton has written another heartwarming love story. I love the way she makes her main characters shine. She uses their flaws to make them unique and charming and because of that their good personality traits become even more profound. She instinctively gets relationships and that is something I absolutely love about her stories. They're vibrant and entertaining with plenty of energy. Beach Music is a terrific story that truly sparkles. Sonia is lonely. She hides behind brightly colored dresses and pretends she's an expert when it comes to relationships, but deep down she's insecure. 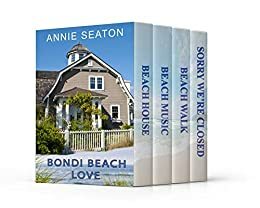 She's a skilled tarot card reader and the business she runs with her sister and best friend used to be a success, but ever since they both fell in love they're spending less and less time at the big house at Bondi Beach where they initially all lived. When her sister invites fashion designer Dave for dinner Sonia doesn't expect him to be rude to her, but that's exactly what happens. Dave is dealing with a big problem and never meant to hurt her feelings. Will he be able to make it up to Sonia and will she like him once she gives him a second chance? Beach Walk is a fascinating story about true love. Dave is a creative man. He designs beautiful clothes and has made a name for himself with his amazing style. Something is bothering him though and finding out if it could be fixed kept me on the edge of my seat. Sonia initially tries to avoid this grumpy man, but he melts her heart when he sees the woman underneath the explosion of color and does his best to make her feel better about herself. They are a fascinating unusual duo and I couldn't wait to find out how their story would end. Annie Seaton combines a stunning setting with emotional turmoil and plenty of exciting twists and turns. It was fun to see how Sonia and Dave get over their initial hostility and slowly start to like each other. I loved how natural their relationship develops. Annie Seaton knows how to write a great feelgood story and Beach Walk is another delightful lighthearted romance. It's captivating, endearing and sweet.